I was originally contacted by Box Steam Brewery about their collaboration with Big Big Train – a band I’d not previously encountered. I get quite a few contacts from companies and (more often) PR firms and it’s surprising how often they seem to be, at best, poorly targeted – this year I’ve been getting a lot of information about Swizzler sweets and ham, and while I’m certain they’re both tasty, they don’t really fit on a drinks blog! In this case, however, it would have been hard to be approached with a better match. Big Big Train is a progressive rock band, and as my long suffering wife will attest, I’m a bit of a prog rock nut. Meanwhile, the beer in question is a very tasty sounding porter – which is one of my favourite beer styles. This is not a post about that beer. 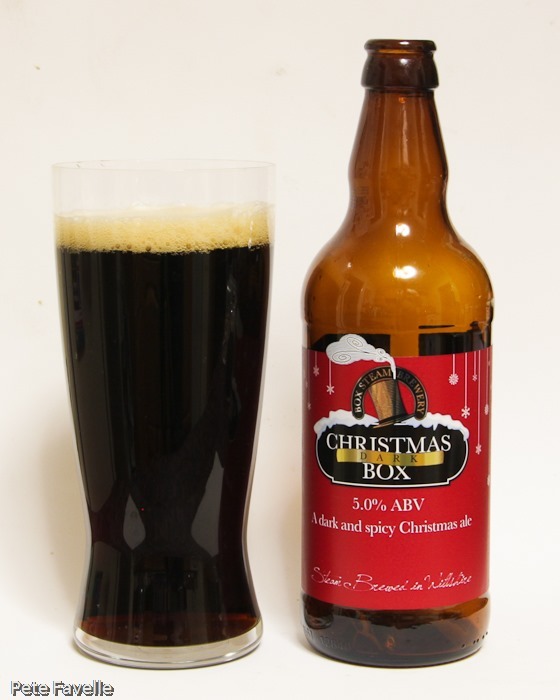 What actually arrived in the post was Box Steam’s two Christmas beers, as they’d run out of samples of the Big Big Train beer. On a musical note, BandCamp had no such supply issues, so although I can’t recommend the beer I can heartily recommend that any prog rock fans check out the music! 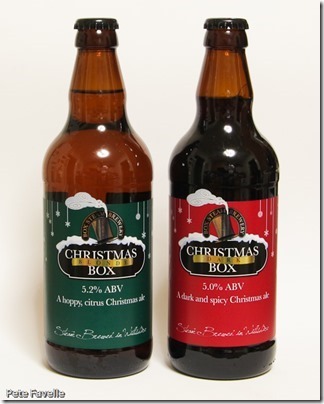 Box Steam, rather unusually, produce two Christmas beers – a pale, hoppy ale and a more traditional, darker one. 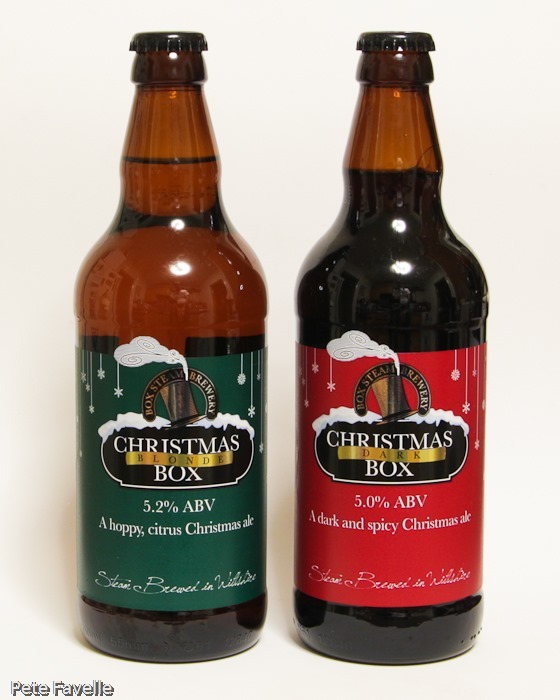 The labels are certainly nice and festive, with classic red and green colouring and snow! 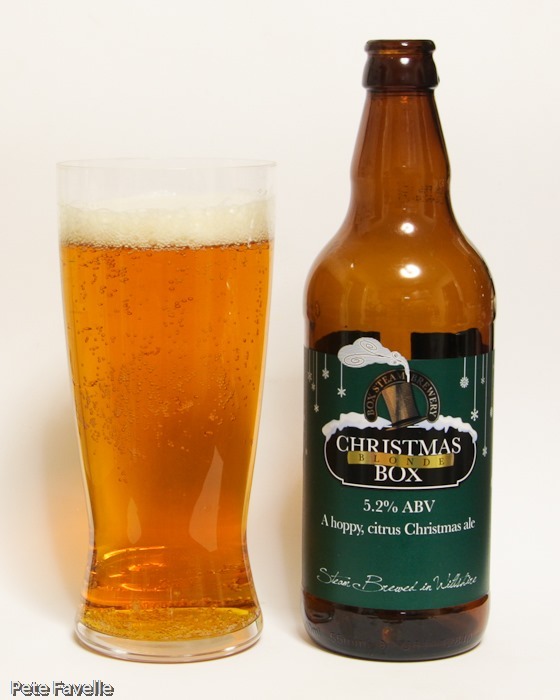 The Christmas Box Blonde is the pale version and the strongest of the two, at 5.2% ABV. The label describes it as “hoppy, citrus” which aren’t two adjectives that immediately make me think of Christmas, but maybe I’ll be surprised. It’s a golden ale, with a thin head and large, rising bubbles – there’s something almost cider-like about the appearance. The nose is a fairly standard British pale ale, with a little sweet toffee, blending with earthy hops. Underneath that, there’s a definite touch of lemon and a suggestion of freshly ground black pepper. There are no surprises in the mouth; a slightly sweet start is followed by a nicely rounded but restrained hop bitterness. Overwhelming that, though, is an excessively gassy character. Somehow I find myself strongly reminded of those cans of Best Bitter from the corner shop in my Midlands university days. I actually quite like it aside from the fizz, but it’s about as far from Christmas as a beer can possibly get. The Christmas Box Dark is – obviously – the darker offering, a touch weaker at 5.0% ABV. It’s a good looking, dark reddish ale with a thin, pale tan head and much less in the way of big cidery bubbles. The nose once again has a nice hoppy earthiness to it, along with a pleasant whiff of molasses and just a slight hint of dark, roasted spices. In the mouth, it’s much lighter than the nose suggests, and it’s foamy without becoming fizzy. There’s not much sweetness to be found, with much more emphasis on a bitterness that I suspect is coming from both hops and spices – sadly the more aromatic elements of the spicing fail to translate from the nose to the taste. This is certainly more traditionally Christmassy but the spices don’t quite work, and the whole thing feels a little unbalanced. Many thanks to Box Steam Brewery for these samples, and for introducing me to a new band to enjoy! I love craft beer. In Spain they are becoming increasingly popular and appreciated again. Very nice!